Besides the fact that it is cool to have your picture taken under one of your own teak trees there are many other good reasons to grow teak. Plantation teak is offsetting the worldwide demand for old growth teak from National Forests in many countries. Illegal cutting is still going on. So it will help to save National Forests for many good reasons. The teak market is a global commodity market and the price is set globally. Although Europe and the USA are a part of that demand, the price of teak is determined by global demand. The demand for teak from up-and-coming countries like India, China and Thailand is strong due to the need for qualified and durable building materials. If you are thinking about a good way to pay for the education of your children or grandchildren, growing teak trees would be an excellent choice. 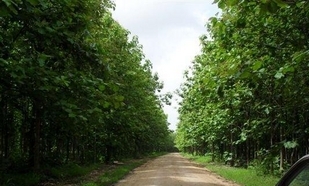 The value of teak trees already may start paying off after seven years. There is a potential for tax savings, since you will be a tree farmer and there are special rules for agricultural activities. In the US you may have to file for an agricultural business status unless you already are a farmer. You may be able to deduct a portion of your cost as an expense of doing business as a farmer. The reason is: you do not own the property, but you do own the trees and your expenses in Belize may also be treated as necessary business expenses. You should check with your accountant though for detailed information on this. The Belize monetary system is directly tied to the U.S. dollar. One U.S. dollar is worth two Belizean dollars. If the U.S. dollar is losing its strength against other currencies, a global commodity like teak will become worth more. This means that teak could be an insurance against future inflation. Based on the historic records of the teak markets there definitely could be the potential of higher future prices. When teak logs are cut into graded quality sawed lumber, the prices increase sharply. We do have our own milling facilities to offer you that service as well. Once the trees are maturing cutting could start, but you do not have to harvest if the global markets are down. After seven years the first thinning of the trees has to occur and after another three to five years, most of the thinning is done and you can let the trees mature. The lumber from older trees has more quality and size, therefore the increase in price will be relatively faster than in the first ten years. The ultimate value in size and quality of teak will be at the end of 25 years' growth.